are hosting a Mill Valley Job Fair! Want to have a booth at it? Here's the application. Email us here with questions! Interested in joining the Mill Valley Chamber? Hear it from our members in the video below – and get more info here. DONATE NOW to the Enjoy Mill Valley Fund & support local beautification projects! 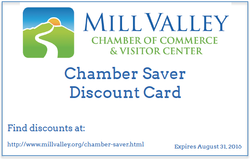 Click the card below for dozens of discounts from your fellow Chamber Members!! We create greater opportunities for your business in Mill Valley. Whether you are a large corporation, a retail business, a service provider or an independent professional, the Mill Valley Chamber of Commerce is here to advocate for you and provide you with an array of unique marketing opportunities to reach both residents and visitors. We have a strong relationship with the City of Mill Valley, a dedicated Board of Directors, talented Staff and growing membership, and we welcome you. Learn about the benefits of Chamber membership. Find out about Chamber-sponsored events. Discover more about doing business in Mill Valley. Founded in 1953, the Mill Valley Chamber of Commerce was the first Marin County Chamber of Commerce certified by the County as a green business. The Mill Valley Chamber has taken a leadership position through its eco-friendly initiatives.